I have rewritten the weather tracker. 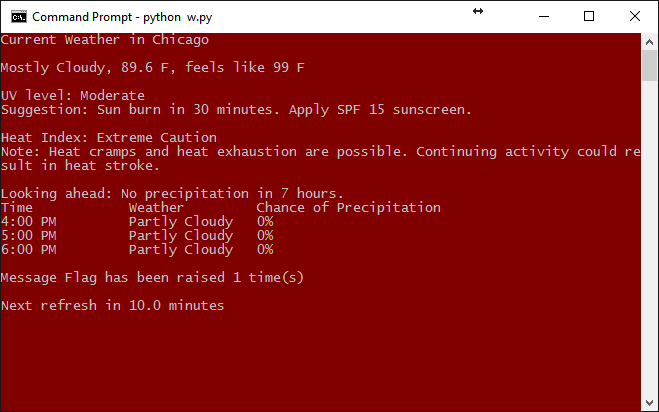 The script now requests the weather forecast data in the json format, instead of prior xml. Using json format makes my code much easier to read, because the decoded data from json is dictionary data type used in python. Besides, it reduces my api calls significantly the the app refreshes, now every forecast report only needs 6 api calls from wunderground. I also added the function to determine the geolocation based on the public IP. Public IP is obtained by calling the api from ipify.org, and this IP address is sent to freegeopip.com to obtain the zipcode. The script now is interpreting the UV index not just as a number, but as a suggestion how to understand the UV. Same thing is applied to the Heat Index. 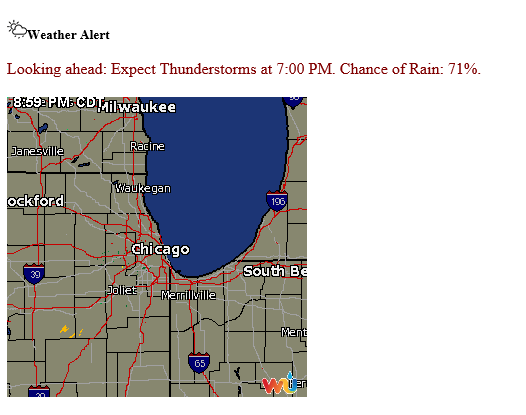 Weather forecast is now able to look ahead for the next 7 hours, if the chance of precipitation is above 50%, an email will be sent to the recipients as a weather alert.